When it comes to politics, this year proved to be historic in many ways. A businessman that had no experience holding public office became the president of the United States. Hillary Clinton became the first woman nominee of a major party and Bernie Sanders was the first Jewish candidate to receive serious backing for the highest office in America for the Democratic Party. 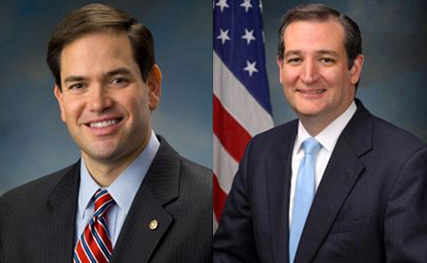 However, the Republican Party also had two Hispanic contenders that had a strong chance of becoming commander and chief of the United States in Cuban Americans Marco Rubio and Ted Cruz. Earlier this year in March, President Obama also announced an end to the Cuban embargo, which has slowly been coming to an end, but that might very well change with Trump’s presidency. Nothing has been more momentous than the recent death of Fidel Castro. His timely passing comes after half of the Cuban-American population in Florida helped to decide who will become the new leader of their country after being angered by President Obama’s decision to start to lift the embargo, a right they would have been denied if in Cuba. Of course, this led to many Americans across the country wondering what the two most famous Cuban political candidates in the United States most recent history had to say. With both Cruz and Rubio having immigrant parents that fled Castro’s rule in Cuba, it wasn’t hard to guess. Both were angered by Obama and Canadian Prime Minister Justin Trudeau’s condolences to the Castro family and lack of acknowledgment to his political crimes. That was one word that Rubio used to describe Obama’s statement to the Cuban people. Rubio was not alone in his sentiments towards Castro, as Cruz tweeted his disgust towards both the dictator and Trudeau who praised el Comandante’s power as an orator over the island nation. Rubio also had choice words for the young Canadian Prime Minister admiration for Fidel.